spence here once again! back on the trail! after a long, beautiful, sunny winter in the high desert of new mexico, billy and i found ourselves waning a bit from house-sitting gigs. we took a golden opportunity (we had a house-sitter for our house-sitting gig!) and an excellent excuse (my birthday) to travel north to telluride, colorado. in all my years, i never get sick of fresh air, waterfalls, river valleys, ancient trees, mountain views, good brews and alpine lakes. we drove about three and a half hours from gallup, nm to the town of telluride, on clear roads. an easy trip, cutting through little towns called rico, dolores and stoner. the history of the area is as intriguing as the cool people and micro brew names (face down brown is my favorite.) however, while i appreciated visiting telluride, its really the mountains i will remember. appealing green, rolling mounds, even greener pines, purple rock slopes, dark shadows and white caps. i was surprised there wasn’t more snow on the mountains, thinking about it being spring in june at 10,000 ft in elevation–another sign for the drought monitor. we camped in an open meadow the first night, after picnicking in telluride park. the lizard head wilderness stretched out before us, as we ate chips, sipped some ale and talked about the next days plans. i bought a guide book in town, a bit shoddy on actual helpful information, but heavy on small town historical lore, and still worth reading. we decided on the navajo lake trail…something with a water feature. 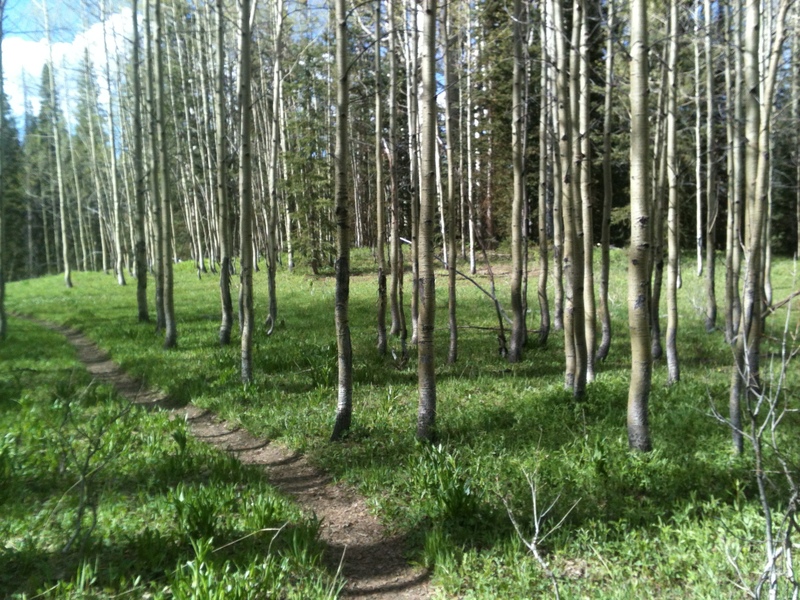 in the morning we leisurely packed up and after billy frolicked in the meadow behind our camp, we set off down dunton road–a slanty dirt one-track–lined with aspen. i was thrilled to smell the green and anxious to stretch my legs on the trail. we decided at the last minute to backpack in and stay the night at the lake, allowing us more time to enjoy the trail. we hiked steadily up, although not painfully up, until the last mile of switchbacks. the navajo basin, from which the west dolores river is created, did not disappoint. the river crossings lacked danger, but were mighty cold, with chunks of ice still floating in them. we arrived at the lake, some 5-6 miles up the basin, passing several snow drifts, however, the trail was gleefully clear. the sunshine and uphill walk warmed our bodies and our hearts as the 60 degree day burned on. around dinner we got to the lake and the temperature was brisk already. spending a fair amount of time enjoying navajo lake, we finally agreed to camp lower (the lake is at 12,000 ft) seeking a warmer night’s sleep. near a soft grassy knoll, creek-side, we finished our wine and hit the sack. we took precautions with food and brought our backpacking bear vaults along, securing our food just in case–even though no signs were posted anywhere about bear protocol or safety. good thing we have done this before because later that night a bear came sniffing around the tent. our only trouble with the bear was lack of sleep and billy’s backpack getting micturated upon. This entry was posted in Backpacking, Hiking, Summer, Travel, Writing and tagged Colorado, Navajo Lake, Telluride. Bookmark the permalink. that’s some of my old stompin grounds. lizard head pass is a grand hike, and have spent many a night in the telluride park! nice to see some new views! Well, looky there, I know this neck of the woods. Gary’s brother, Mike, has his cabin of thirty years nestled below Lizard Head just a few miles from Rico. Delores has fabulous little grocery store, with the best beans around.